Week 2 down, and I’m still going strong. I have cleared out a ton of stuff…stuff I didn’t even realize we had! And in the meantime, I’ve found lots of things we’ve been looking for. I have to admit that I’m starting to get into areas that I’ve been avoiding. These are rooms and storage areas that are totally overrun. I’m having to remind myself that I only need to tackle one box at a time. I don’t need to finish the whole room in one day. Otherwise, the whole thing just seems so daunting! The kids have been taking a big interest in this challenge…sometimes just out of curiosity, and occasionally out of concern! I’m also taking this opportunity to introduce a few skills to the kids. Right now, since we all (my husband and I included) have such a problem with putting things away, I’m working on taking one thing back to its rightful place every time we go from one room to another. Just think about the cleaning power we’d have if all of us did that one little thing! 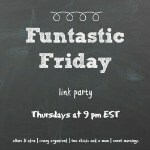 Last Friday was Day 9 (yes, I know I’m a few days late with this post! ), and I decided to tackle the dresser next to my bed. It has long been a piling place for stuff that I didn’t know what to do with. So, there was a ton of junk piled up on it. There was a bag of broken toys and toy pieces that needed to be returned to their sets. That was easy. Throw out the broken things (mostly treasures from meals that supposedly make you happy), and get the good things back to their rightful places. Check! I also had a big stack of old magazines sitting on the shelf above the dresser. They joined the broken toys. I had an entire drawer full of old, um, undergarments (for the top region) that haven’t been worn since I became a mother…my size and shape has changed so much that I’m never going to be able to wear those again. Why were they taking up valuable storage real estate? It turns out that there are charities that request those…I had no idea! I also found a drawer full of clothes waiting on me to repair them. Now, I didn’t get rid of these, but, I set up a station for them next to my sewing machine’s storage spot. It makes more sense. Now I can see them, and take care of them sooner, before the stack gets so daunting! Day 10 was Saturday, and I was hoping to get to something that I needed my husband’s help for, since he was home…but he had other things outside that needed attention, so that will have to wait. So, instead, I tackled my room again. I had piled my desk high with all sorts of things. This is a common theme in my room. It’s the place everything that doesn’t have a place gets stacked when we go on “somebody’s about to come over panic clean mode”. Then, since there’s a crib in the middle of the room, and a baby sleeping there whenever I get a free minute (you know, because the baby’s asleep), I never clean it up or find places for those things that don’t have a home. So, on the desk, I found another stack of clothes waiting for repair…I added them to their new station. I found a huge box of expired cosmetics. I don’t even wear makeup on a day to day basis. I occasionally use it on special occasions or if I’m having a picture taken, but that’s about it. I now have a much tidier small bag of what I will actually use! I had a box collection of paper that were misprints from the printer. That went away. I also found several bags with a couple craft-type items each. I can now see the desk. It was WONDERFUL! I was able to print out our school-work without climbing over anything. Day 11 was a brand new fresh Monday. I was back in my room again, working this time on the closet. The closet was what originally inspired this whole challenge. I had already cleaned out the hanging portion before this challenge started. So, I decided to work on the floor. At least, I was pretty sure there was a floor under there somewhere! I found a bunch of old shoes that I had collected. Now, there’s a little known fact that no one tells you about having kids. Every time I get pregnant, my feet grow a little more. When I got married, I wore a size 7.5 shoe. Now, I’m up to a size 9.5! Amazingly, I still had all of my shoes from before the kids. That was an easy box. I organized the purses and belts that I still wanted to keep, and put the others in the box with the shoes. I did save a few pairs of nice shoes that I put in the shed, in case the girls are interested one day…and wind up wearing the right size. If not, I guess it will make for a nice donation a few years down the road. Day 12 was Tuesday. Tuesdays around here are tricky. We have to do all of our school work first thing in the morning, and then we generally load up for town right after lunch. Bear has allergy shots and Rhino has speech therapy in town on Tuesday afternoons. So, I don’t have a whole lot of time on Tuesdays. So, I did a quick run down on the book case in my room. It was storing a bunch of used preschool workbooks. I saved one from each kid for sentimental reasons, and threw the rest out. Another pretty easy box. On Day 13, I started to tackle the loft above our room. This is one of those really scary areas. It’s a storage area, but it’s supposed to be functional, too. It’s not really functional right now! As I ascended the stairs, I kept chanting to myself…just one box, just one box. I found a box with mostly used craft supplies and school supplies. I went through it, and saved the useful things, and put the rest in the trash, or in a box if I thought someone else could use them. I didn’t really figure we needed 8 different sets of addition and subtraction flash cards, or 11 (yes, you read that right) sets of multiplication flash cards. Yikes! There’s still a ton to be done up there (and on the stair leading there), but that was all I had time for that day. Thursday (day 14) was another busy day with an extra appointment in town. So I decided to clean out the kids’ art supply cabinet. I found a bag full of empty paint bottles, lots of crumpled up paper, and a bunch of dried out markers. My oldest daughter does clean it out from time to time, so it definitely wasn’t as bad as I feared it would be. It was another trash day, though. Now, we’re back to Friday again…Day 15. My husband took the day off to deal with some chickens, so our routine was a little off from usual. Even so, I plowed on through. I tackled our DVD and VHS (yes, we still have a VCR!) collection. There were a couple of broken VHS tapes that I’ve been meaning to throw out for a while, but every time I tried, I couldn’t find them. I finally managed to get those out! We have DVDs under the TV, and those are all watched fairly consistently. I also had a huge collection of movies that I’d bought in college that were in a table (one of those types that also doubles as a storage compartment) next to the couch. They were largely inappropriate for my children. I’m not entirely sure why I’d been saving them. If they aren’t appropriate for my children, why are they appropriate for me? So, out went a box of inappropriate movies. I am consistently amazed about the things I’ve been holding on to. It is scary, but also quite freeing to let so much of this stuff go. I’m finding that I have some sentimental attachments to a few things, and that’s fine. Those are things that can stay. I don’t really have any family heirlooms yet (with a few exceptions, and I would never part with those, Mom). My mom still has most of the family china, and quilts, and that sort of thing. I hope she keeps them for many more years to come! So, most of the stuff that’s leaving really isn’t useful. It’s just sitting there, taking up space. Some of it would be useful to others…so why not give it a chance to be used? It’s getting easier! Here are a few of the boxes…in the back of my husband’s car already! Whew! What a week! Bear turned nine, everyone got sick, we had an unplanned trip to urgent care with Baby, and, even with all of that going on, Momma was a decluttering machine! Unfortunately, my husband was so anxious to get the boxes out of the house before I changed my mind, I didn’t manage to get any pictures of all the stuff that left this week! The second he found them, he scooped them up, and out to the back of his car. I’m rather proud of how things are going so far with this 40 bags in 40 days challenge. On Day 1 (Ash Wednesday), I decided to start off fairly easy with our bathroom linen cabinet. I wasn’t sure I’d be able to get a whole box, so I was a little worried. But, oh my! Let me tell you, my worries were TOTALLY unfounded. There was so much stuff up there. The first day, I only got through the top shelf! I found all kinds of nice things (like a never-used table cloth meant for a circular table…ours has been a rectangle since I moved out of my first apartment). There were 5 different place mat and napkin sets with 4 settings each, along with 2 four piece napkin ring sets…that won’t go very far in this house! Along with the nice things, I found 3 (THREE!) tattered old mattress pads. Why would I keep those??? Day one, and off to a good start. As Day 2 of 40 bags in 40 days dawned, I was excited. I was going to tackle the rest of the bathroom cabinet. We had sheets, sheets, sheets, and more sheets. I didn’t make a huge box like I did the first day (and there wasn’t anything there that was worth donating…but hey, at least I’m getting it out of the house), but I had no problem filling up a jumbo-pack size 4 diaper box (mom’s-you know what that looks like!). I had several full-sized sheet sets that were full of holes…so those went away…along with 4 mattress pads (also full of holes) for a crib-sized mattress. It is sooooo nice to be able to see what I have in that bathroom cabinet now! Day 3 is where things started getting tricky. 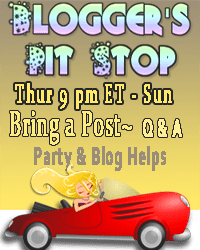 I had originally planned to tackle the boys’ room, and do the girls’ room on day 4. But Day 4 was also Bear’s birthday…and she didn’t want to do her room on her birthday. So, since birthday wishes do come true, and I really didn’t care which room we started in, Day 3 was spent in the girls’ room. I plan to do several rounds in both kids’ rooms. They have so much stuff! So, we did the first round of a toy purge. Not quite as painless as days 1 and 2! Bear was ready. I think she was almost as happy about it as I was. Lizard was having a lot of trouble with the ordeal…understandably. But, she perked up when she realized that someone else would be able to have fun with the things she was giving up. It was really sweet. We managed to find a small box of toys that both (older) girls were willing to part with. We also cleaned out 1 kitchen-sized trash bag worth of trash. It seems that packrat-itis runs in families. Day 4 of the 40 bags in 40 days challenge was Saturday. My husband was home, and he had a different project in mind than I did. He had just finished up our second bookshelf for the living room. Homeschoolers need a lot of bookshelves. So, the new plan: move the new bookshelf into the living room, move the girls’ old bookshelf out of their room (it was falling apart), move the old living room bookshelf into the girls’ room. Did you follow all of that? Of course, with all of that bookshelf moving, came a lot of bookshelf unloading. What better time to do a little decluttering? So, the boys’ room would wait for Day 5. Most of the removal came from the bookshelf in the girls’ room. There were 2 bags full of loose paper projects wondering around, along with 2 boxes full of used up coloring books. Day 5 was Monday, and we went back to resume the plan…so on to the boys’ room we went! We removed a bag of trash, and several toys with a large footprint that no one played with anymore. At that point, I moved the toys we had taken out of the girls room into a bigger box, and put all the things that we took from the boys’ room with them. I don’t think it’s cheating really. It was a huge box! On Day 6, we moved back to the girls’ room to tackle the closet. I am truly astonished at how much stuff they had crammed into the closet floor! We didn’t even make it to the rest of the closet. We just worked on the floor. There was a whole bag of paper trash that they had stuffed in the closet, and we boxed up a bunch of dress up clothes to save for Baby when she gets big enough to enjoy them. The next day, we had to make an unscheduled visit to urgent care with Baby. She had an ear infection that even made the doctor say, “Oh Wow!” That’s never a good sign. So, we lost pretty much the entire day. But I wasn’t going to let that derail my efforts on the 40 bags in 40 days challenge. I pledged to make up our lost day on Day 8. Yesterday was Day 8 of the 40 bags in 40 days challenge. We went through all of the kids’ dresser drawers to get rid of all the things they don’t wear, or are worn out, or too small. Again, I was amazed. My girls had both been stashing “treasures” in their dresser drawers. Some of them were more treasure-like than others. I cleaned out half a bag worth of trash from each set of drawers, making one bag of trash (paper, and broken toys mostly) total. I let them keep the things that were truly worth keeping. We pared down their clothes collection so that they each got a drawer they can use just for their “treasures”. Of course, I made them promise not to stuff it full of crumpled up typing paper again! Bear kept nearly all of her clothes, because, as the oldest, she just doesn’t have very many. Lizard had been keeping a lot of clothes hidden from me that she wanted to keep even though she had outgrown them. I found a few 4T sized clothes in there…y’all she wears size 7! There was a box of clothes to donate and a box to keep in the shed for Baby. To make up for Day 7, I also cleaned out the boys’ dresser drawers on Day 8. There was a full box worth of clothes to donate, along with a box of clothes that were too small for anyone. The season of Lent is almost here! Ash Wednesday is almost upon us…this year, it falls on St. Valentine’s Day. Have you considered what you and your family will be doing for Lent this year? I have trouble with this every year, to be honest with you. But this year, I’m ready! This year, we are going to tackle the 40 Bags in 40 Days Challenge. 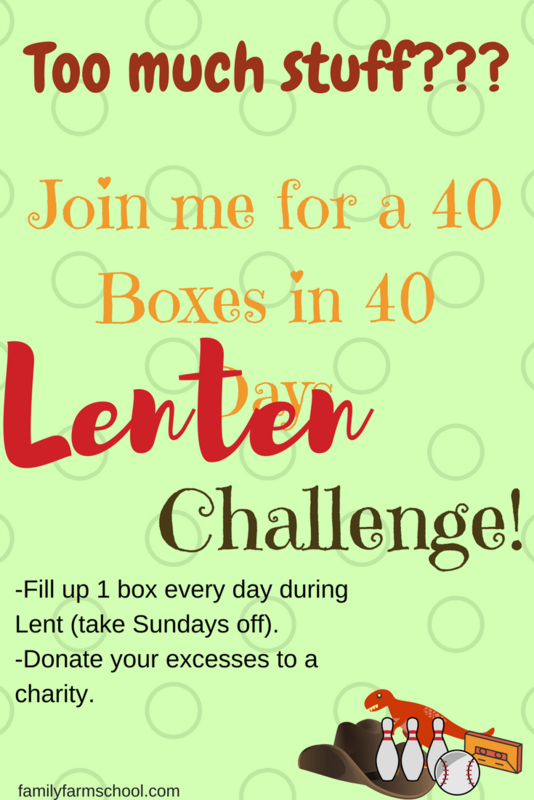 What on earth is the 40 Bags in 40 Days Challenge, you ask? Well, it’s a way to tackle all of the clutter that builds up in your house. We have 7 people and 3 dogs who live in our house…a small house, approximately 1000 square feet. Seven people (even little people who can’t even talk yet) can accumulate a lot of stuff. We have stuff everywhere. It doesn’t help that my husband and I are both stackers. We get something out to use it, finish using it, and set it someplace…we don’t put it away right then. I always think I’m going to come back in just a minute and put it away, but I never do. I tell myself, “I’m going to need that again in a few hours. If I put it away, I’ll have to climb on the chair again in a few hours to get it. I could just leave it on the table, and then I’ll have it ready next time I need it.” All fine and good for one thing…but it’s never just one thing, and it seems that there’s never a good time to put them all away! So, the clutter piles and piles and piles. The biggest problem is that we have so much stuff that all of our convenient storage space is already taken…storage space is at a premium around here in the first place! So all of our cabinets are stacked precariously, our tupperware containers await their next unsuspecting victim, our dresser drawers are crammed full, our closets are overflowing, and the toy boxes…well, you get the picture. Alright, so now we know the problem. Too much stuff. But, going through, room by room seems such a huge, daunting task! Well, that’s where 40 bags in 40 days comes in. The goal is that for each day during Lent, you remove a bag or box of stuff from your home. It can be any size. But, each day, you must remove at least one box (or bag). As long as the stuff is in good condition, donate the items to a worthy charity. What a great way to teach myself and my children about being good stewards of our resources and helping other people all at once! It seems like such a simple idea! Imagine, 40 boxes worth of stuff…gone. Not just gone, but gone on to someone who can really use it. I have high hopes, in case you can’t tell. I’m rather embarrassed by the state of my home, honestly. We can hardly move! 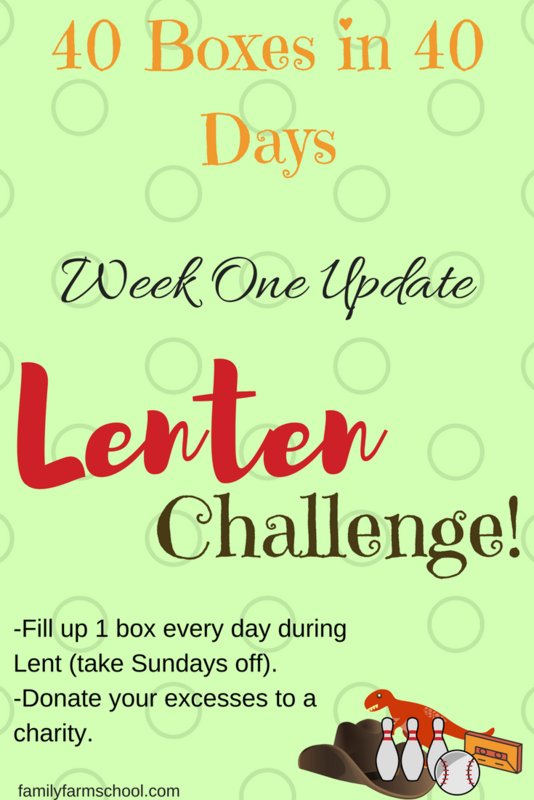 I’m hoping that by the end of our 40 Bags in 40 Days Lenten challenge that perhaps we will have gained a bit of breathing room. I hope you’ll follow along with us as we free ourselves from the stuff monster during this period of sacrifice and reflection. I promise to update you on our progress weekly. It’s summer here in central Texas…and it’s HOT! But, with four mobile kids, being stuck inside all day, despite the heat, just isn’t an option. 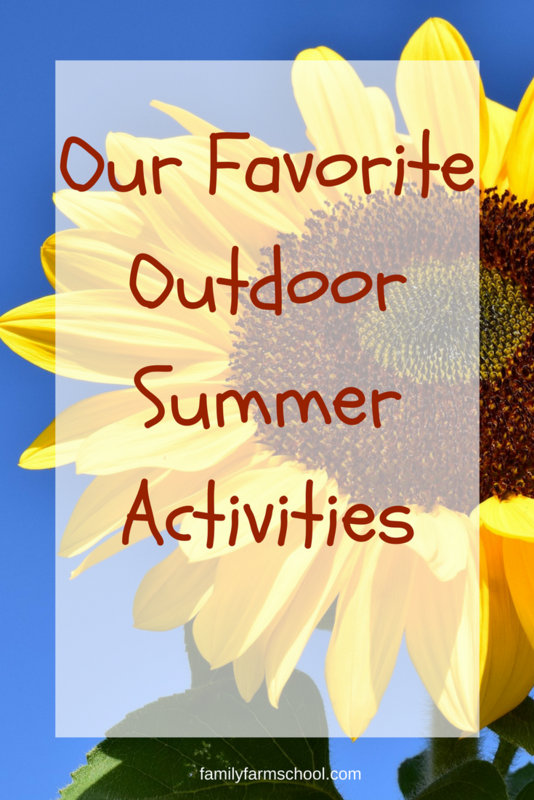 So, today, I thought I’d write about some of my kids’ favorite outdoor summer activities. 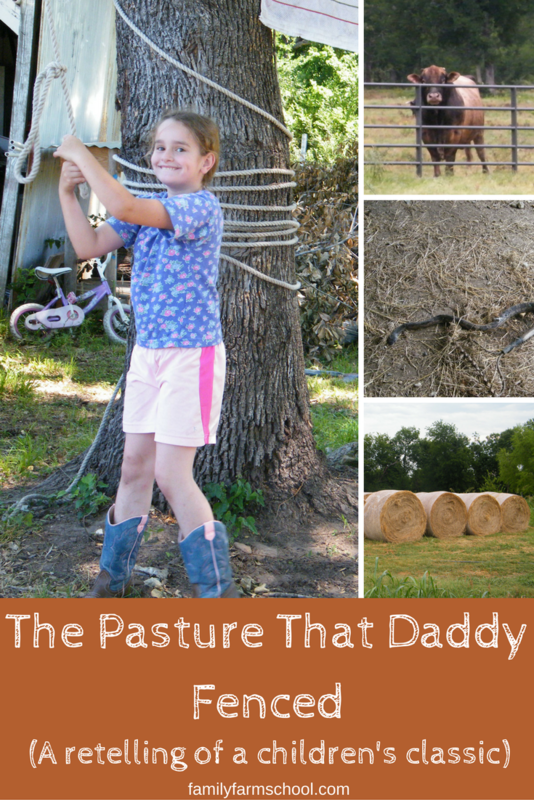 Some are childhood classics, some are definitely ‘farm kid’ pastimes, and others will just downright make you cringe! Keep reading, if you dare! What kid can resist playing in the pool? We make occasional trips to the “big pool”…you know, the kind where the water is higher than your ankles. But here at home, we don’t have anything fancy like that. We buy a wading pool at the beginning of each summer. We still haven’t found a way to keep them usable from summer to summer, so we have to get a new one every year. I spend many an afternoon watching the kids splashing around. Their splashes keep me just cool enough to stand being outside! They play all sorts of imaginary games. Dolphins, whales, “fast fish” (whatever those are), crocodiles, sea turtles, and even the occasional mermaid…my front yard is full of aquatic wildlife when the pool is out. My husband and I are constantly amazed by the amount of communication skills that go into a single game of make-believe! Plus, we (and by we, I mean my husband) can give the garden a good watering when it’s time to empty the pool. Nearly everything – even playtime – has to pull double duty around here! My husband put a rope up in one of the trees to aid in processing the hogs after they were slaughtered. The next day, our kids came out and found the rope still hanging from the tree branch. They didn’t see a hog rope, they saw a fun time! My kids are weird, remember? They stand on the side of my old truck, hold onto the rope and jump off, swinging across the yard. Occasionally, only under proper supervision (they know they’re not allowed unless one of their parents is right next to them), they get to “foot swing”. They put a foot into the loop in the rope and (usually) their Daddy swings them up, high and fast. Their ol’ Momma has even tried it a time or two. It feels like flying…at least until you can’t hold on any longer! The. Best. Christmas. Gift. Ever! These logs were a collaboration between my dad and my husband. My husband came up with the idea, and my dad brought them to life. These are landscaping timbers cut into varying lengths. Then, Dad drilled holes at even increments along the flat sides of the timbers. Pipes can then be inserted by the builder through all the layers to make sturdy structures…much like Lincoln logs, but on a much bigger scale. These logs have built castles, houses, boats, backyard fences, corrals…you name it! If Bear is missing, you can almost bet that she’ll be outside building something. The rest of the kids really get into it as well, giving her ideas of new structures to build. What list of outdoor activities would be complete without bubbles? I usually make our own bubbles at home with a little Dawn, water and sugar…otherwise, we’d go broke buying bubbles all the time! The kids really enjoy blowing bubbles. They especially like to chase each other’s bubbles across the yard in hopes of popping them before they fall in the grass or float over the pond. Occasionally, a bubble will float past a dog who will try to catch it. Sadly, the dogs never have anything to show in victory, other than a bad taste in their mouth! I know what you’re thinking when you read that title. But, you’re probably wrong. Our Border Collie, Patch likes playing with the kids. She also likes playing catch. A lot. She’s usually the dog that ends up catching bubbles. But, Patch will try to catch pretty much anything thrown in the air…tennis balls, sticks, dirt, fertilizer (much to my husband’s consternation), and of course, balls of mud. One of the kids’ favorite variations on this game is throwing small twigs or pebbles into the pond. Patch will then take a flying leap into the water (what’s not funny about that?) to try to retrieve whatever was thrown in. If was a stick, she’s usually successful. However, if it was a pebble. she’ll swim around desperately trying to find it. Of course, the children think this is quite hilarious. I wind up with four sets of muddy feet and a dog covered in pond scum. What joy is mine! Our pond starts to dry up in the late spring. If we’re lucky, we get enough rain during the early summer that our pond doesn’t completely dry out (our first year living here was 2011, and by the end of the summer the pond was bone dry, not even a muddy spot left!). But, either way, it gets much smaller. Our children often form a little roaming band and tramp around the pond bed finding interesting critters, or playing some imaginary game. The game often degenerates into playing mud-ball catch with Patch. Bear will often bring her nature journal and nature identification guide with her. She takes great pleasure in finding, drawing, and identifying little creatures and plants that have made their home in the dried-up pond goo! I’m glad they have fun, and I suppose it’s even a little educational. But, again, it tends to end in mud-covered shoes, clothes, and dogs! Ah, I’ve saved the best for last! I know this one is likely to make many of you shudder. But, this is, hands-down, my kids’ favorite game! They run outside as soon as it stops raining (usually before if there’s no lightening) so they can get to the puddles before they dry up. As you can tell from the pictures, they get gross! But, it’s nothing a water hose can’t fix. I suppose all that fun is ultimately worth the mess! If you would like some tips on how to deal with kids and mud without losing your sanity, check out this post. Socks. I despise socks! Socks comprise a major part of the laundry around here, and I can’t really figure out why. They’re relatively small, and my husband is really the only one who wears them regularly. You can usually find me wearing a pair of flip flops…rain or shine, hot or cold, it doesn’t really matter to me. Our children don’t like socks. The oldest decided several years ago that they made her feet sweat, and said so within earshot of her younger siblings, who, in their quest to be like their big sister, have followed in her bare (but not sweaty!) footsteps. If you find any of my children walking around with socks inside their shoes, rest assured, there has recently been a knock-down, drag-out fight over the occasion. I’ve found, in motherhood, that it’s important to pick your battles. 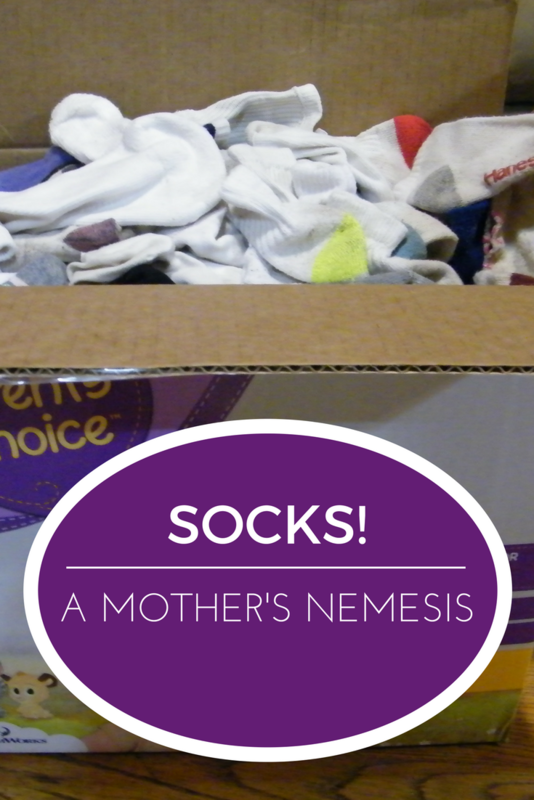 There are circumstances that I will force the children to wear socks…but most of the time it just isn’t worth it. So, how is it, then, that socks have come to represent such a large portion of the laundry? Honestly, I have no idea where they all come from. If you know, please tell me the secret! Really…it’s driving me crazy (yes, dear husband, I know…it’s too short a trip to waste the gas). I am a wife and the mother of five children. I love my family. We live on a farm…no pavement in sight. You know what that means, right? Dirt. Dirt, dirt, and more dirt. Then it rains. Then comes the LAUNDRY! Loads and loads and loads of it. But, that’s just the tip of the iceburg. Let’s not forget the dishes. My youngest doesn’t eat solid food yet, and is exclusively breastfed. She doesn’t contribute to Dish Mountain. So, that makes six plates, six cups, six forks, six spoons, six knives…plus all the pots and pans to cook in…for breakfast, lunch, and dinner. Doesn’t my life sound glamorous? Housekeeping is NOT one of my gifts. Yes, I said it. I don’t enjoy housework…I’m really not very good at it. I don’t see all those little tasks that need to be done to keep a house truly clean and comfortable. I’m generally happy if I manage to keep the dishes clean and enough clean clothes in my kids’ drawers. I’m very lucky that my husband is an enormous help in this department, too! He can often be found washing dishes with the kids (like, every night after dinner while I’m putting the baby to bed), folding laundry, or sweeping and mopping the floors. But, there are always so many more things to be done…and with a two month old infant, even the basics often seem to slip. Alas, I fall further and further behind. There’s not enough time or energy to tackle that growing pile of clothes waiting to be folded…much less that big project that needs to be done! But, I knew what I was signing up for eight years ago when I quit my job to stay home with my oldest…I thought. Of course, the load has gotten a little heavier with each addition to the family, but that’s to be expected. 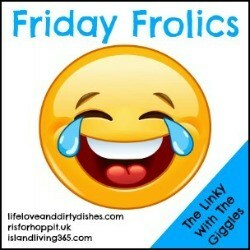 My biggest problem is that I tend to look at the housework all wrong. I’ve always measured myself, and my personal success, on what I can complete. What I can finish. What I can check off that good ole’ to-do list. 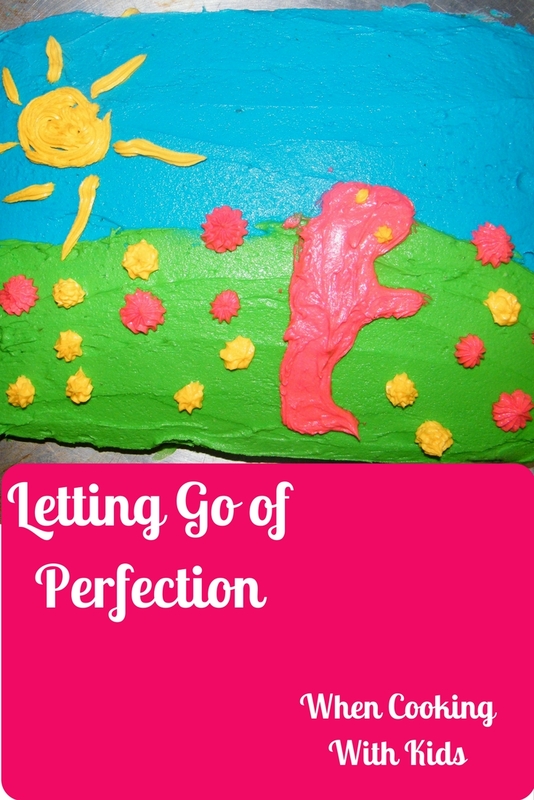 With my housework, I always felt like such a failure. Ten minutes later, I visit the bathroom and the hamper (OK, I’ll be honest, it’s usually the floor in front of the hamper) is already full again! “All that time spent, and nothing to show for it.” Sigh. But then, “Mom! Can I have a snack?” And of course, if one person is hungry, everyone else realizes they’re famished too. They find and finish their snacks, leaving dish carnage in their wake. It’s not enough to justify a whole new sink full of dish water (No, we don’t have a dishwasher), but if I don’t do it now, after dinner it will look like a dish sculpture of Mount Everest. I looked at the housework as something to be accomplished. Completed. Defeated! But I got so discouraged because it just simply cannot happen. It isn’t possible. Even if I were to get every single article of clothing in the house clean, folded, and put away, we’re still wearing something while it’s getting done. So it isn’t done. If I can help my kids learn the right attitude about it all, they’ll be so far ahead of me. My way isn’t the right way to think about all the housework. Now that I have daughters who are getting old enough to actually help, I have to do my best to make sure they don’t get this attitude about work, and about life in general. Because honestly, that’s what housework really is…LIFE! If I can help my kids learn the right attitude about it all, they’ll be so far ahead of me. So, now, for that all important question. How should I try to teach myself to think about housework? How should I teach my kids? I already know how NOT to do it. But how SHOULD I do it? Well, I’ve got to look at it as an on-going process, not something to be completed. We can’t stop living because I just swept and mopped the floors. I have to learn to accept that life happens. There’s going to be a dog (or 3) who just took a nice swim in the pond trailing my husband who’s carrying a big pile of still mud-caked turnips inside from the garden the day after a good rain. That’s ok. So what? I’ll try again tomorrow (and make my husband sweep again after he’s done washing the turnips!). I also have to learn (and teach!) that if I’m doing my job right (which I rarely am), no one is going to notice. But, that shouldn’t be why I do it anyway. Housework is my act of service to care for my family, to make my guests feel welcome and comfortable…whether they called first or not! This is one (of many) ways I should be showing love for others. I should expect nothing in return…not even praise for a job well-done. If I can impart this hard life-lesson early on in my daughters’ lives (and my sons’ too), that’s just another way to help them live happier, healthier, more satisfying lives than have I. One way I’ve started is by making sure we do ourZone Cleaning twice a day, every day! This program really helps them break down each cleaning task into manageable chunks. It also helps us all remember that keeping our home neat and clean is an ongoing process…not something to do that stays done forever. We have to come back to it many times every day! It’s a work in progress, but someday, maybe I’ll figure it all out! A friend of mine recently posted on Facebook that she had lost her phone. She has been looking for it for a couple days. Hopefully, by the time I finish writing this post and get up, she will have found it! It can really be frustrating when things get lost. It’s even more frustrating when you look everywhere you can think, and you still can’t find it. If you have small children who share your home, you must learn to think like a toddler if you want to find your missing item. Maybe it’s your phone, maybe your car keys or wallet. Maybe it’s the keys to the tractor. 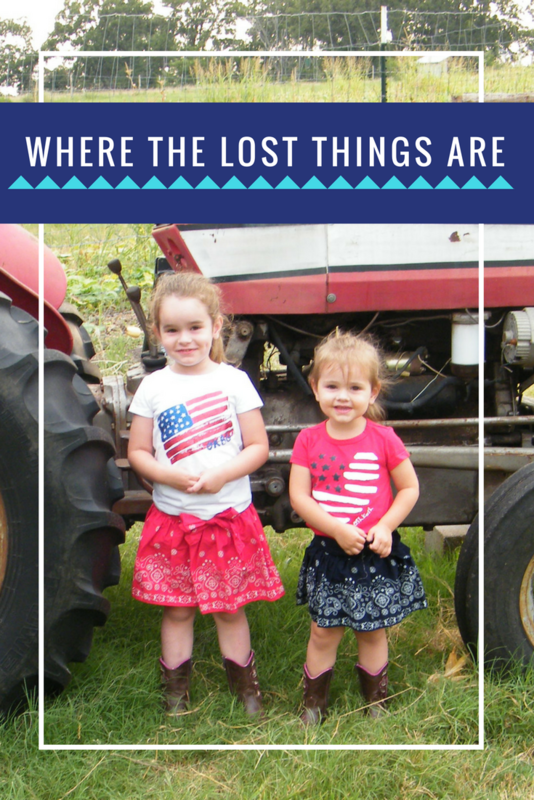 So, for those of you who are lucky enough to have a toddler or preschooler living in your home, I’ve put together a list of the strangest places I’ve ever found my missing items…maybe it will help you locate that long-lost set of house keys! Thoroughly inspect every crevice of your dishwasher. Look on the inside, look on the outside. Check inside that little hollow area right under the door handle. Bear hid my phone in that little hollow once. I searched and searched for my phone. It disappeared on a Friday afternoon. We looked all weekend, but we couldn’t find it. I was pregnant with Monkey at the time, and we decided it would probably be a bad idea for me to be alone at the house without a phone. So, Monday morning, I loaded the girls into the car, and went to purchase a new phone. All was once again right, and I had learned that I should keep my phone up in a higher location! A few months later, we were giving the dishwasher a thorough cleaning. I saw something weird in the gap underneath the handle. I got a pair of kitchen tongs and managed to pull it out. There it was…my long lost phone…found months too late. It even still worked! It became a decoy phone for the kids to play with. It’s still wandering around the toy boxes to this very day. …that is inside a stuffed animal backpack all crammed down together in the bottom of a dress-up box. I can’t make this stuff up! One of our dear children once absconded with the tractor keys. For a week, my husband had to hotwire the tractor if he needed it (it just happened to be that time of the year when it was needed…often). Daddy was mad! We looked all around the tractor for the lost keys. We knew one of the kids was responsible for the disappearance, but we weren’t sure which one…though we had our suspicions that it was Lizard. We really thought they had been dropped outside somewhere, so we searched the entire yard. I had the kids out searching every day. One day, I had the girls inside cleaning their room, which looked like a scene from some sort of natural disaster stricken area. Bear pulled out the backpack. She looked inside, and pulled out the purse. Lizard looked up and said, “Oh! I wondered where this was!” Then Lizard grabbed the purse and looked inside, wondering what sort of long-forgotten treasure she would find there. Her face was priceless. She looked up at me, and back down into the purse and sheepishly pulled out the tractor keys. “I forgot!” was all she said. Then, she started laughing hysterically. We showed Daddy, who was still a bit irritated, but glad to have the keys back. This is one of Rhino’s favorite places to hide things. Of course, being a family of seven, we don’t ever get the small bag. Oh no…we buy the 25 pound bag. I’ve pulled phones, keys, and toys out of the bag of flour. It’s at that perfect height that just invites little hands to investigate! Plus, it’s in a bag that’s in a box under the cabinet. The multiple containers make it extra fun! This is Rhino’s other favorite place to hide things. But, inside a table? How does a small child put things inside a table? Well, we have two tables that have an inside. One is the coffee table. It’s on wheels, so he can push it around the living room. The top opens so that ideally, you can store blankets or magazines or books…whatever you need accessible but out of site. It also has doors on the sides so you can access the inside that way. Rhino likes to put things in the top, then locate them in the blanket stack from the side. It’s a fun game…until something gets lost in the folds of a blanket. Then, the mystery can quickly become a tragedy…especially if no one saw him put the item inside the table. We looked for his “nice” for days once. His nice is a little blanket that he always sleeps with. We finally found it inside the coffee table, wrapped up in another, much larger blanket. We have another table that folds up and stands against the wall most of the time. It only comes out when we have company and need extra seating at meal time. The chairs for the table fold and are stored inside the table. There’s a little door on each side that opens so that the chairs can be removed. It’s a neat little table that has been with me since my college apartment-dwelling days. Since the children came along, though, many a small item has turned up inside that little table, sometimes fallen between the cracks in the folded chairs. We were visiting my parents a year or so ago. Rhino was toddling about with his sippy cup most of the afternoon. When dinner time came, he was very thirsty, and really wanted some juice. But, no one could find his cup. We looked everywhere! Still, no cup. We finally caved and got out a fresh cup for dinner, but we still needed to find it before we left. We didn’t want to forget the cup (we only keep a couple at home), and I’m sure my mom didn’t want to find the cup months later…no one enjoys that kind of surprise! The next day, I happened to open the tupperware drawer (looking for something else, but still unfamiliar with they lay-out of my parents’ new kitchen), which was one of the lowest drawers in the kitchen. Again, it was the perfect height for little hands to explore! Low and behold, there was something bright orange showing from an upside-down stack of Ziploc containers (or possibly Gladware…who can tell!). The color caught my eye, since everything else was clear plastic. It was also odd for the stack to be in the drawer upside down. So, I lifted the overturned stack, and there it was…the missing sippy cup! Found at last. We were all relieved. So, if you ever find yourself missing an item and you have little ones in the house, think like a toddler. Look inside of stuff that’s inside of something else! Your mom may have told you to look where you left it, or maybe to retrace your steps. “It didn’t grow legs and walk off!” Well, the moral of the story here is…maybe it did! It just have grown some pint-sized legs and walked somewhere strange…somewhere strange and exciting-to a toddler anyway!